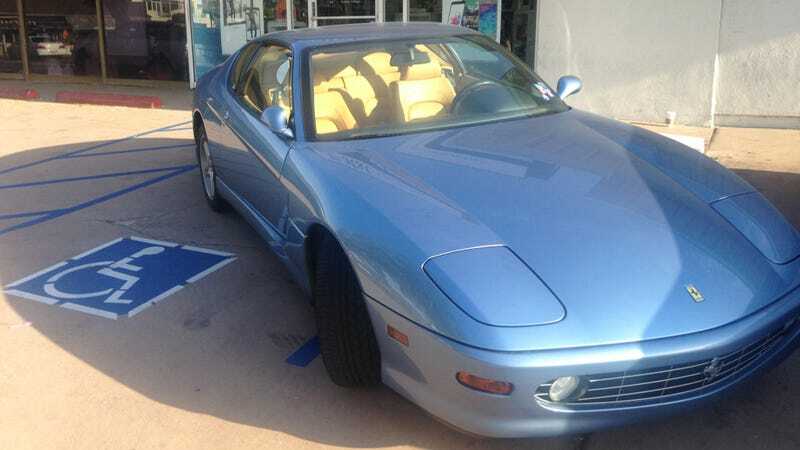 Here's a Ferrari 456 parked across two spots, one of which happens to be a handicapped space. The thing is, this driver isn't an asshat, and there's one simple reason why: He's driving a Ferrari 456. This is a service to society. Normally, when you see a Ferrari parked like a jerkoff, it's a 458 or a California, Ferraris that are normally driven by dunderheads and doofuses. But the 456 is a Ferrari driven by connoisseurs. These are people that aren't going to be drag racing you at a street light or cruising in South Beach looking for tail. No sir, they'll just be going about their normal lives. So this owner isn't the best parker. So what? He's displaying his lovely, rare, V12 Ferrari in front of an AT&T store for the public to take in. We should applaud this man, not demonize him. Update: This post is sarcasm that seems to have gone over many heads.